The iOS Photo Stream feature is a really great way to share photos between friends and family who also have an iPad or iPhone. 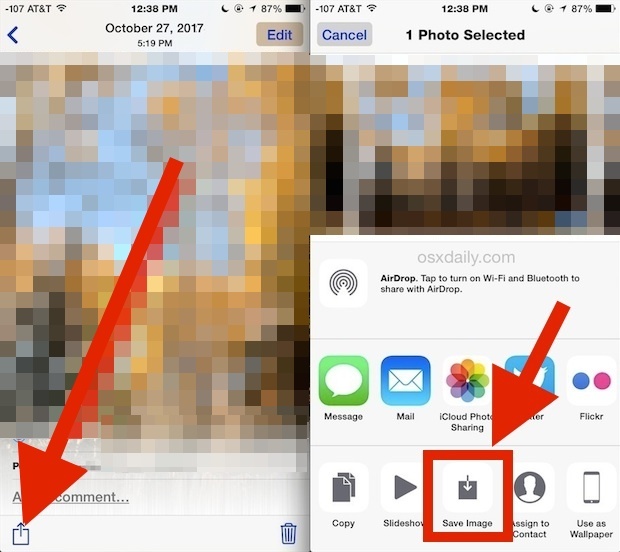 Each shared Photo Stream and the associated images are kept in iCloud, viewable through the “Shared” tab in the Photos app, where they are cached temporarily as you look at them. Yes, that means Photo Stream pictures are not always directly stored on a device. If you want to save one of those images from Photo Stream to your iPhone or iPad and have the full resolution version directly stored on your device, for editing or offline access, it’s quite easy to do. You can save a single image from a shared Photo Stream, or use a batch selection process to download locally a group of many photos if you need to save multiple images from a stream to your local iPhone or iPad. The next time someone shares a great picture with you that you want to keep outside of iCloud, you can download it to your iOS local storage using either of these tricks. This saves a copy of the picture to your device so that it can be edited, passed along, or viewed offline, but the image will continue to be on the Photo Stream share too (unless it’s deleted, anyway). Repeat as necessary with other images if desired, or use the multiple selection trick to save a variety of pictures at a time. At the moment, there is no ability to select an entire date range like the excellent bulk delete trick in iOS Photos app, but perhaps that feature will arrive to the Shared tab soon which would make saving entire streams much easier. Keep in mind that each picture from an iPhone is anywhere from 3MB to 6MB, so saving a large amount of pictures from Photo Stream will not only take a while to download, but they can also take up a notable amount of storage space on your iPad or iPhone too. If the process is interrupted, typically the full resolution image fails to download and you’ll be left with a low resolution version on the device instead. If that happens, simply go back to the Shared stream and elect to download that specific photo again. Of course this requires that you have iCloud and an iPhone or iPad to save the pictures to, if you don’t have that option or you want to share a picture with someone who does not have an iOS device, generate a website from a Photo Stream and send along the URL to someone, or your own computer or other device, and then save the picture from the web like you would any other. How do I save a shared video to my iOS device from iCloud Photo Stream? 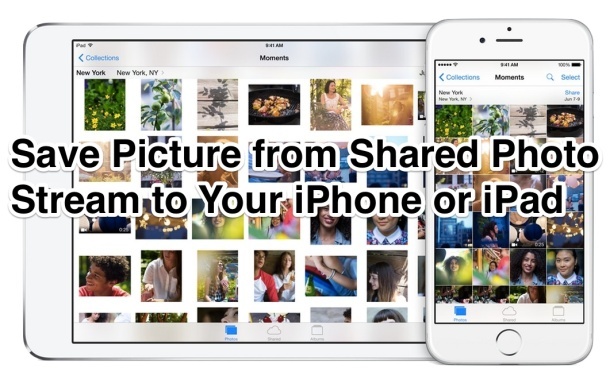 Apple offers the ability to save photos from iCloud Photo Streams and shared streams. At the moment, Apple does not offer the ability to save video from iCloud shared photo streams. If there was an option to save a video from iCloud Photo Stream, it would be available through the “Sharing” button just the same as saving an image from shared streams exists. Why this limitation is in place is not clear, but it remains in modern versions of iOS. Thus if you want to save a video from a shared photo stream to an iPhone or iPad, ask the person who posted the video to iCloud to share it with you directly instead, perhaps through Messages. However, both the Mac and Windows PC offer an ability to save videos from iCloud shared streams. Interesting, never really thought about how the photos aren’t stored locally because the Photo Stream counts against local storage. But you’re right, if you turn on Airplane Mode, the images are not accessible beyond what is cached, yet they take up full size space anyway, LOL. So I just went and downloaded a few good ones that I want here all the time, good tip. Now, why the cache counts against storage is ridiculous, I guess that’s just Apple further eating up the precious small storage on iPhones, and that it counts against the woefully inadequate iCloud storage is hilarious too – I still can’t believe they nickel and dime us for $10/mo or whatever it is to back up our iPhones to the iCloud, when I paid $950 for my iPhone Plus! So factor in that iCloud expense times two and real iPhone cost – without even a cell phone plan – is $1200! Unbelievable. You have a link to: Generate a website from a Photo Stream. At that link, your instructions are to: Open “Photos” and tap the “Photo Stream” button at the bottom. On a somewhat related topic – I stream photos to my AppleTv. However, I don’t want every photo I take with the iPhone to display on the AppleTv. Other than editing the photo stream at the AppleTv, is there any way to prevent a photo from streaming or control it from the iPhone? Sure you can save videos from the Shared Photo Stream to the iPhone with this, try it out yourself. There is no way to save a video from shared streams. I use to be able to, but the feature is gone now. Can you double check this topic and get back to us? I would LOVE to be able to save videos again. if the creator of the album makes it public (go to people -> scroll to weblink and make it public) you can use the online weblink to save the videos. So you can save the videos to your computer and send them to your phone after. If you didnt create the album then you will not have the option to make the shared album public and will have to ask your friend to do so. I don’t think this is actually true, if you compare the average size (in Mb) of photos saved from Shared Photo Stream to those taken with your own camera and directly to the camera to the camera roll, then you will see it is roughly 50%. You can use “image capture” on your Mac to do this. I am not sure if it is actually possible to get a full resolution image taken by somebody else and shared through iCloud Photo Stream. I can save photos from a stream that was shared with me, but I can see no way to save videos; please would someone explain how to do this? Cameras switch easily between photos and videos, and people often record an event with a mixture of photos and short video clips, so why does Apple treat them so differently? Hey for some reason my photo sharing button won’t let me click it and it’s really frustrating ! Any one know why?